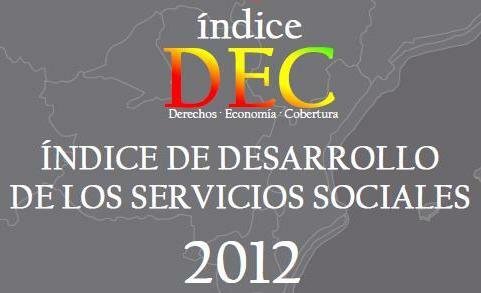 The Index of development of social services 2012, issued by the State Association of Directors and Managers in Social Services, is a report that analyzes the level of development of social services in Spain. This study assesses the current situation of social services in the Autonomous Communities with respect to the average of the State, allowing for the analysis of the deficits of coverage, as well as the prospects of protection of the social resources. It also includes recommendations to be adopted in each Autonomous Community for the protection of these services to be effective. In the report, appear numerous references to the services of social care addressed to persons in situation of dependency. The Index evaluates the situation of the social services in each community scoring of the economic relevance that are granted to them (3 points), the big picture in terms of rights and political decision-making (2 points) and the degree of coverage, and citizenship (5 points). The classification levels ranging from “irrelevant” to “excellent” and depends not only on the number of points to obtain the region in total, but the passing or failing in each of the areas analysed.